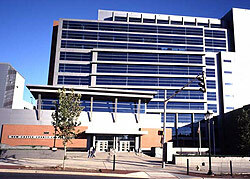 is available at the Leonard L. Williams Justice Center parking facility which is located next to the courthouse. The parking facility may be entered on either Walnut Street (on the left-hand side after crossing 4th Street) or King Street (left turn after passing Wilmington College) and is open weekdays from 7:00 am to 7:00 pm. View a list of parking lots and garages in close proximity to the courthouse and their daily rates.